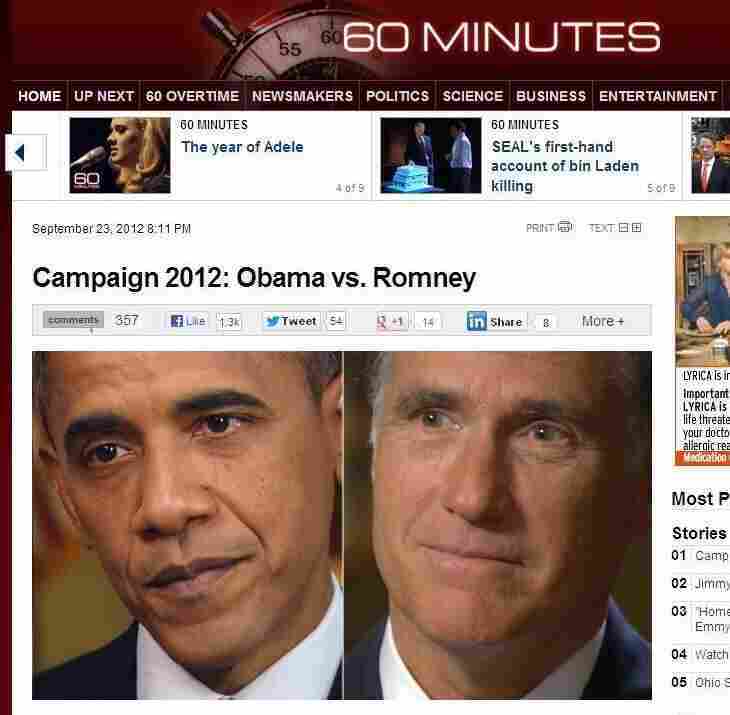 Debate Preview: Obama And Romney Shadow Box On '60 Minutes' : The Two-Way The first official presidential debate isn't until Oct. 3 in Denver. But interviews on CBS offered a sense of what the tone may be like next week. The first official presidential debate isn't until Oct. 3 in Denver. But as The New York Times writes, last night on CBS News' 60 Minutes there was something of a "shadow debate that offered a likely preview of the tone and substance" of what will happen on stage next week. The Times notes that Republican nominee Mitt Romney, "criticized President Obama ... for refusing to meet with Benjamin Netanyahu, the Israeli prime minister, during this week's United Nations General Assembly meeting, saying it sends a message that the administration is distancing itself from an important Middle East ally." Obama, meanwhile, "said he spoke frequently with Mr. Netanyahu ... [and] also challenged Mr. Romney, who has accused Mr. Obama of not standing up forcefully enough to Syria and Iran, to be more specific about his foreign policy plans. 'So if Governor Romney is suggesting that we should start another war,' Mr. Obama said, 'he should say so.' "
On Morning Edition, NPR's David Schaper reported that during the interviews, Romney also said "I'm going to win this thing," and that when it comes to the details of what loopholes, deductions and exemptions he would eliminate to help pay for his plan to lower taxes, "that's something Congress and I will have to work out together." Pressed on why the nation's unemployment rate has remained above 8 percent throughout his time in office, Obama repeated something he's said many times on the campaign trail — that "the hole was so deep when we got in [office] that we lost 9 million jobs. We've created 4.6 [million]." 60 Minutes has posted its report, and videos from the interviews, here. For more on the 2012 campaign, see It's All Politics.